The first-round series shifted to Stockton after the Barracuda and Heat split their first two games in San Jose. 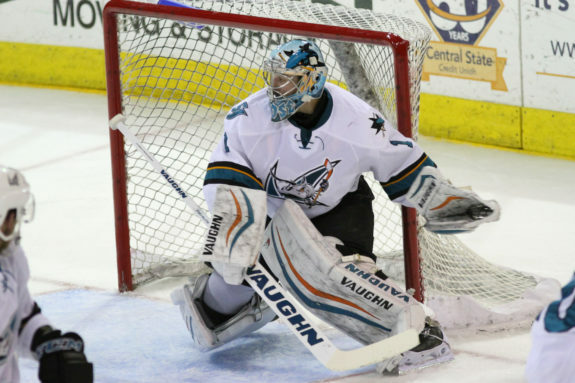 Marcus Sorensen returned from the San Jose Sharks to fully reload the Barracuda with all their available talent for the first time in 2017. The speedy Sorensen skated with Danny O’Regan and Kevin Labanc and were overall an active line but lacked the shift-to-shift electricity that fans saw during the early part of the regular season. The Heat again showed why they were the team no one wanted to play in the first round. Mark Jankowski was a force throughout both games with his mix of size and skill proving difficult at times to contain. Stockton went with David Rittich in both games at home, and he was instrumental in their Game 4 victory to stave off elimination and force a deciding Game 5. As the Round 1 match-up shifted to Stockton, the Barracuda used a three-goal third period to put the game out of reach and take the series lead. San Jose drew first blood on a goal by Barclay Goodrow early in the first period and added their second goal as Danny O’Regan blasted a one-time past Rittich to make it 2-0 with 16 seconds left in the opening frame. After the first intermission, Stockton regrouped for a strong middle stanza, something the Barracuda have allowed thus far in the series. The Heat’s two goals came from their heavy line of Mike Angelidis, Brandon Bollig and Jamie Devane with both Angelidis and Bollig getting their first of the series in the second period to knot the game at 2-2. You know what, the guy is a playoff guy. Last year he was out best player. Two years ago, when we were in the Hershey series, [Carpenter], Haley and another kid were our best forwards again. So he knows when to shine. The two teams skated in the tie game until the last five minutes of action in what turned into a nail biter. Ryan Carpenter gave the Barracuda a 3-2 lead on his backhander goal. Timo Meier ripped a Chartier two-on-one pass through the five-hole of Rittich to make it 4-2 less than two minutes after Carpenter gave San Jose the lead. Meier also attributed much of his goal to his teammates. In the final minute of action, there were some tense moments as Chartier took a goaltender interference penalty with 89 seconds remaining. Heat defender Micheal Kostka gave Stockton a sliver of hope with his power-play goal with just 28 seconds remaining. Buddy Robinson potted the empty-net goal moments later to seal the victory for the Barracuda. With a chance to eliminate the Heat and move on the to the second round, the contest got off about as well as it could for the Barracuda. Danny O’Regan jumped on the ice and took a pass from Timo Meier for the opening goal in the first minute of action. It would be the only goal of the first period. The second period foreshadowed what was to come. Once again the Heat came out of the first intermission re-energized and ready. Stockton used two goals in less than two minutes to take a 2-1 lead as Hunter Shinkaruk as a big hit on Heed by Matt Frattin created a turnover and Shinkaruk knocked in a back-door pass. 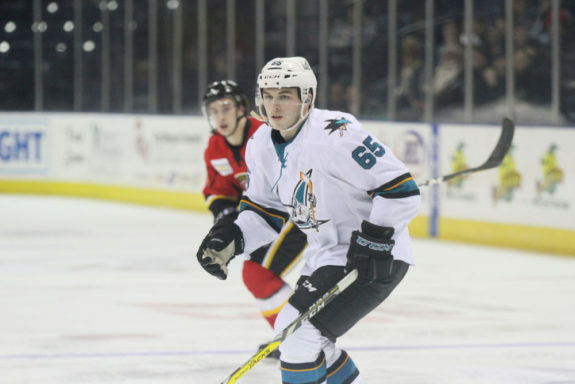 Stockton went up 2-1 as Garnet Hathaway deposited the rebound of Oliver Kylington’s shot past Troy Grosenick after a scramble in the San Jose crease. With 2:05 left in the second period Buddy Robinson continued his strong play this postseason as he fired the puck at Rittich from the end boards that ricocheted past the Heat netminder. In the third period, Tim Heed blasted San Jose’s third goal to regain the lead as he took a Timo Meier pass and slapped it top-shelf past Rittich. The pressure continued as the Heat were staring down elimination until Andrew Mangiapane connected with 5:05 left in the game as he took a centering feed in the crease on his backhand, brought the puck to his forehand and snapped the puck past Grosenick for the equalizer. San Jose’s troubling habit of allowing goals in bunches continued at the worst possible moment as Labanc lost Linden Vey cruising through the slot and he backhanded a rebound past Grosenick to give the Heat their first lead of the game. Vey would ice the game with an empty-net goal. Quote of the Game: “That’s why they play 60 minutes. They got a bounce or two and [the puck is] in our net. It happened quick, kind of what we did to them last time up here. You look at the big picture, that’s why you play for home ice all year long. You’re bound to get into series where you’re going to go seven [or] five in the first round in the American Hockey League. We’ll see. 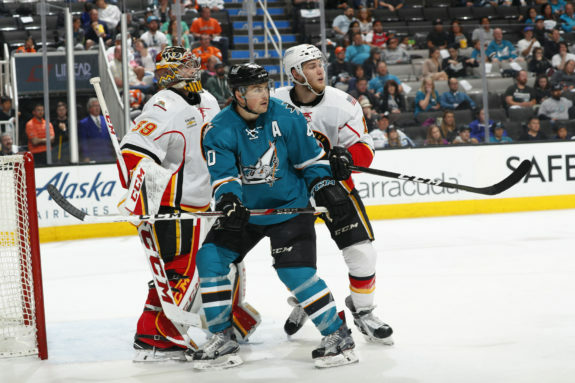 I think we’re the better team, but we’re going to out and prove it.” – Barracuda head coach Roy Sommer. The series now shifts back to San Jose for the deciding Game 5. The Barracuda will have the benefit of last change, hopefully getting the match-ups Sommer wants as the team faces elimination. The Heat and Barracuda have split games throughout the series. Now the two teams will play for their playoff lives on Tuesday at SAP Center in San Jose. One team will clean out their lockers, and the other will take on the winner of the San Diego Gulls and Ontario Reign. Game 5 – Tue., May 2 – Stockton at San Jose, 7:00 p.m.